Greece's deputy prime minister said the government would emerge stronger after winning a confidence vote later on Wednesday and be able to secure parliament's endorsement for an accord to end a dispute over Macedonia's name. Greek opponents of the agreement say Macedonia's new name - the Republic of North Macedonia - reached after decades of dispute between Athens and Skopje - represents an attempt to appropriate Greek identity. Macedonia is the name of Greece's biggest northern region. 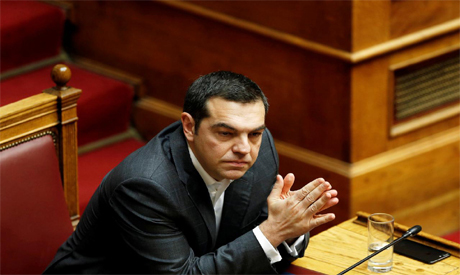 An early election could delay reform implementation, privatisations and Greece's efforts to return to bond markets. Tsipras' party is trailing by up to 12 points behind the main conservative New Democracy party, which opposes the deal. "The government will win a confidence vote and rise stronger and more coherent from this process," Deputy Prime Minister Yannis Dragassakis told lawmakers hours before the vote takes place, around midnight (2200 GMT). "The Prespes agreement will be endorsed because there is the (required) parliamentary majority." Based on the country's constitution, Tsipras only needs to secure half of those present during the vote and at least 120 votes out of the house's 300 to win. But he wants to get 151 votes and have an absolute parliamentary majority. Tsipras' Syriza party has 145 seats in the 300-seat chamber and the support of one independent lawmaker, and needs at least five more to get past the threshold of 150 deputies. Four dissenters from Kammenos's party said they would support the prime minister, while one lawmaker from the small centrist To Potami party said he would also back Tsipras. Macedonia's parliament last week passed an amendment to the constitution to rename the country, leaving it up to Greece to ratify the deal. Greek parliamentary endorsement is needed for the tiny Balkan nation to join the European Union and NATO.